The basic elements of soccer shoes are similar for men and women; both contain cleats on the bottom for traction and stability and allow for fast, quick movements or a sudden change in direction. The differences in the shoes play out in the size, biomechanics and color schemes. Men's feet are generally bigger than women's in both size and width. Soccer shoes are made for males and females separately, though some women prefer to wear men's cleats. In such a case, women should go down a size and a half to accommodate for the gender differences. For example, if a woman normally wears a size 8, she would likely wear a size 6 1/2 men's soccer shoe. 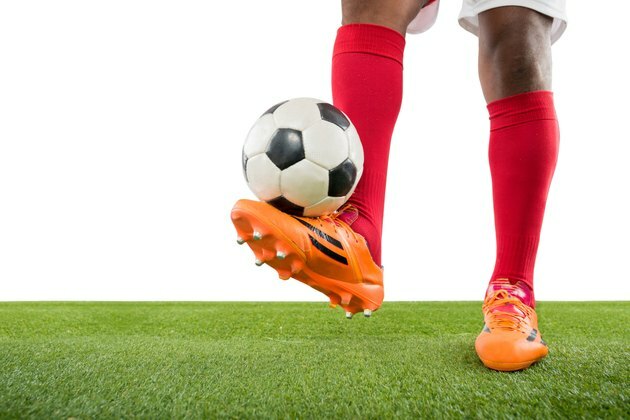 A study published in the "British Journal of Sports Medicine" reports that men tend to place greater force and pressure on the lateral midfoot and forefoot when rapidly changing directions on the field. The result of which is an increased risk of fractures in the fifth metatarsal. Men prone to this should wear shoes that offer stability and support to minimize any chance of injuries. Soccer shoes are made in a wide variety of colors for both genders, ranging from bright red and orange to blues and the more subtle white and black. Women's shoes usually include some feminine color schemes, such as pink, purple and yellow, while men's shoes show a lot of bright blues and greens. What Is the Difference Between Women's & Men's Running Shoes? What Do Soccer Players Wear?